Outdoor sporting events require something that will announce your approval, your spirit, you enthusiasm. Something that doesn't require you to yell for 15-20 minutes (cross country) or over an hour (soccer and football, for example). However, when announcing your presence, you either go loud or go home. The La Gorda Cowbelll, complete with carrying strap, is that announcement. It shames every other "cowbell" in the stadium, on the pitch, on the cross country course. Smaller, weaker bells are banged into submission. The volume of this cowbell cannot be understated. You will be heard, plain and simple. And the athletes will know that you have arrived and are in attendance. There is absolutely no question that this is the cowbell for every occasion, including graduation ceremonies and maybe even weddings (if you have the spine for it). Yes, it shocks both athletes and spectators alike with its booming sound, but in the end, you will be asked many times, "Where did you get that cowbell?" 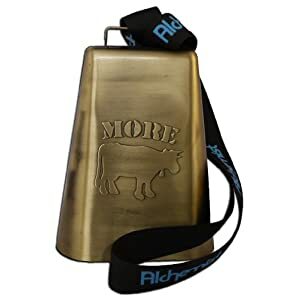 This is truly the Cadillac of cowbells.